Waistband amplifiers are must-have accessories for those who have to address or lead groups on a regular basis. After all, you can’t yell or shout every time – it will put an enormous strain on your vocal cords. Moreover, there are still high chances that people furthest from you might not be able to hear anything. Using the right waistband amplifier can relieve your voice of the heavy burden. Ideally, we recommend a personal voice amplifier kit for tour guides, instructors, youth counselors, teachers, professors, kindergarten staff, and clowns. However, portable voice amplifiers are usually aimed at preventing hoarseness and overstrain of vocal cords. There are numerous choices available to take your pick from – each type is specifically designed to meet certain parameters. Waistband amplifiers are typically lightweight, which makes them portable, so carrying them around is a cinch, as all you have to do is clip them to your belt or use the handy shoulder straps provided. MINI CLASS – The world’s smallest amplifier, strong enough even for a large classroom. POWER – This professional and powerful waistband amplifier includes a built-in USB drive. The students will easily hear you even in large classrooms with background noise. WINNER – A true winner indeed! High volume amplification, low feedback from microphone, and amazing sound clarity are some of its features. It runs on rechargeable batteries that provide power for a week. SMART – This lightweight amplifier is a sturdily built, handy device that is apt for open areas and long distances, despite background chatter. Listeners will hear and understand you easily. Browse through our products at leisure and then make up your mind. PREMIUM - TK-180C - The World's Best Voice Amplification System for the Past 15 Years! The PREMIUM is our most powerful voice amplifier. Built with powerful amplification and exceptional sound quality, this model has proven itself in the field as the strongest, highest quality, most durable and most reliable model, for the past 15 years. 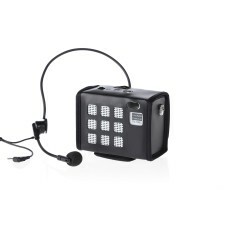 This voice amplifier is great for large, open and/or noisy areas. Musicians love the PREMIUM because with the AUX music input they can connect their instruments to boom across massive audiences. WIRELESS - The latest in personal amplification: A wireless system! Innovation meets design, power and comfort. With the wireless kit, you can move comfortably without attaching the belt with an onerous speaker amplifier and enjoy all the benefits: Massive power, a pleasing sound, durability and zero room for failures.